Selected as a Mexico Ambassador in blogger program run in conjunction with Visit Mexico a few years back, I traveled to Oaxaca City for the first time. Before that, I traveled to the state of Oaxaca for a birthday weekend surf excursion in Puerto Escondido, but this was my first time to the colonial city, my first time to Oaxaca City. I strolled the streets of Oaxaca, visited the market and also took an excursion to San Martin Tilcajete, Oaxaca where the local craftsman (and women) make Alebrijes. They rolled out the red carpet to meet us. 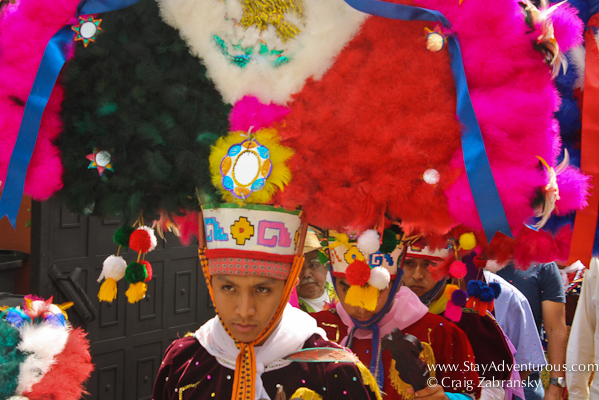 This image was from those festive celebrations as locals dressed in ceremony headdress and entertained us visitors. Oaxaca, like Puebla is famous for its cuisine and specifically its mole. 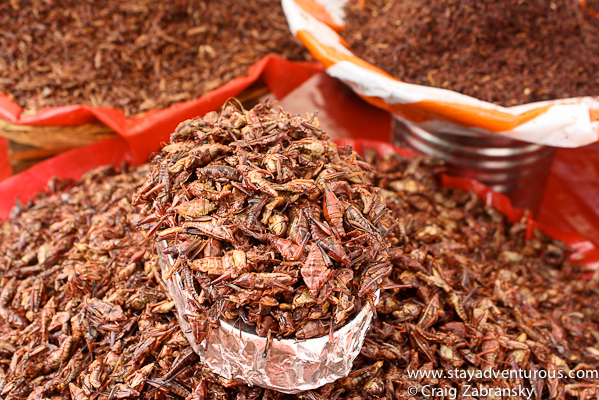 Some believe it is the land of 1,000 moles, but also make sure you leave room for some chapulines too. And, I left so impressed with the colonial city, I know I’ll return (and maybe even run a Stay AdvenTours to the city in 2016). Next time I’ll make sure to visit the local ruins of Monte Albán, put that site on your list too. Mexico Location: Where is Oaxaca? Oaxaca is state southwest of Mexico City and a solid days drive from the Mexican capital. The state stretches all the way to the Pacific Ocean, and is also home to “resort” area Huatulco. When you visit, make sure you are not late to the party. and hopefully the event too Bill, it was a great time in Oaxaca and happy to have met there… Viva Mexico Today!